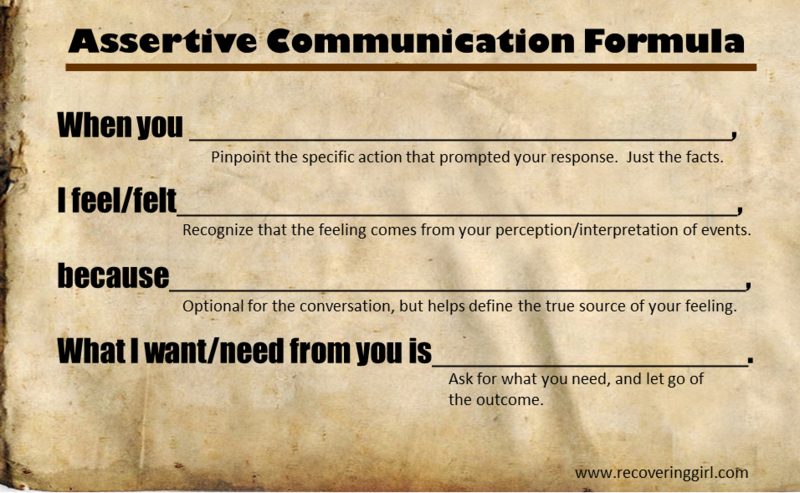 It has been almost two years since I first told you about the assertive communication formula. I sincerely believe that it is an incredibly powerful tool, but I haven’t used it as much in the last two years as I could have. Even though I could see so many great benefits (see original post linked above), it still seemed like it was really just the nicest, most empathetic and self reflective way to tell someone what they did wrong in regards to interacting with you and how you hope they will treat you in the future (not that there’s anything wrong with telling people how you would like to be treated, but that’s not the point of this post). I thought both people in the interaction needed to understand the formula and its intended outcome for the person at whom the assertive communication was directed not to get her/his feelings hurt. Additionally, while “letting go of the outcome” is one of the most important aspects of the formula, I still had a tendency towards hoping they would adjust their behavior once they realized how it affected me and I still hoped to influence/control their feelings about me (by addressing the issue so diplomatically and not alienating them). It was clear to me that the formula was valuable in gaining self awareness and connecting with my feelings, but it wasn’t until I came to some new awareness through Brené Brown’s work that I really understood how/when/why to use it. What I learned from these lessons is that assertiveness is a loving communication. When feelings come up in response to an interaction I had with another person, it is an opportunity for me to share something about my self. To connect with them more deeply. To be vulnerable. And known. And seen. I was not seen or known as a child, but instead of realizing that my parents weren’t able to see/know me for their own reasons, toddler logic told me that it was because my true self was not worthy of being known and seen. So I hid my true self where it couldn’t be reached and created a girl who was visible and worthy of being seen… well… I tried to be worthy, anyway. But it’s time to find that hidden girl and share her with the world. I might not always like the outcome of being real. Sometimes my story will not be met with empathy and understanding. Sometimes assertiveness will not deepen my connection. But at least I can be proud that I was brave enough to own my story and vulnerable enough to share it, that I was not ashamed to be seen. I will know that I am exploring the darkness to find my light. I will know that I am showing up for myself, my true self. I will know that I am running TOWARDS love and belonging and joy instead of away from it and I can finally take comfort in the knowledge that I am allowing myself to just BE the person I was born to be. Perfectly imperfect. 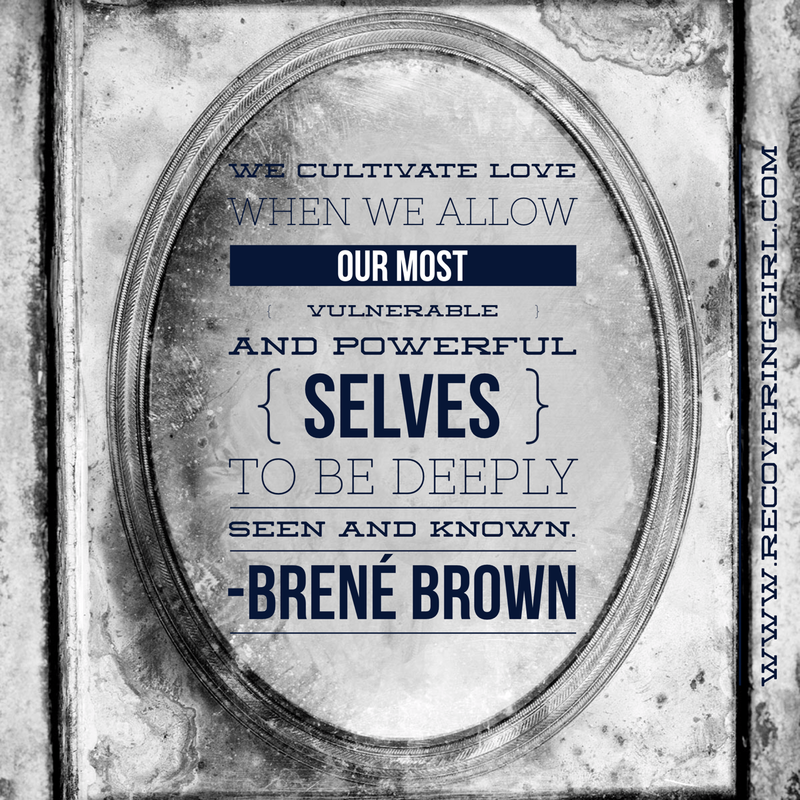 This entry was posted in Uncategorized and tagged assertiveness, assertiveness formula, authenticity, Brené Brown, Brené Brown quotes, connection, courage, healing, quotes, recovery, shame, vulnerability. Bookmark the permalink.